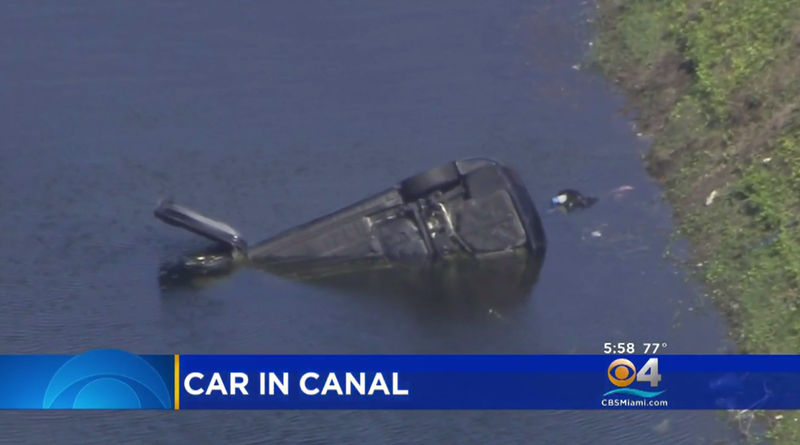 DEERFIELD BEACH, Fla. -- Twenty Good Samaritans are being credited with rescuing a woman and a toddler trapped inside a car that landed upside down in a canal. The South Florida Sun Sentinel reports that a car traveling southbound Friday morning on Interstate 95 near Fort Lauderdale went off the road and into the canal. Inside was 3-year-old Aubrey Herndon, her father, Christopher, and mother, Cynthia Hutchinson, CBS Miami reports. Cynthia was behind the wheel and, according to the Florida Highway Patrol, the car inexplicably swerved out of control. Christopher was able to get out on his own, but Cynthia and the child were trapped inside the car, flipped over in 7 feet of water. A road ranger used a rope and chain to pull the car onto its side, and the Good Samaritans then pulled the woman and the child to safety, Broward Sheriff Fire Rescue spokesman Mike Jachles said, according to the South Florida Sun-Sentinel. Some 20 people jumped in the water or waited on shore to assist. Within minutes, the mother and daughter were out. Video showed paramedics working on the toddler while her mother is loaded into an ambulance. The child was airlifted to Broward Health Medical Center. For those who watched it unfold, it’s a stark reminder of how quickly life can change.